This card was part of my last Technique Class and can be used for any occasion (I used it for Easter). The Parisian Breeze Designer Series Paper is just plain beautiful and versatile. 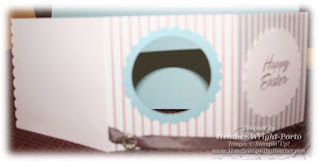 This box was created to coordinate with the Trifold Card and ca be used for many things - to hold greeting cards, chocolates, or other treats or small gifts. 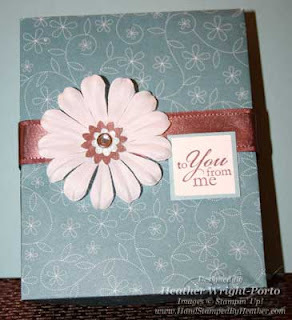 This box is really easy to create and you do NOT need a lot of accessories or stamping or hardwork to make it look beautiful. Blue Bayou Prints Patterns Designer Series Paper (retired). Chocolate Chip, Baja Breeze, and Whisper White Cardstock. Chocolate Chip Satin Ribbon (retired). Large Silk Flower from Pretties Kit. Clear Rhinestone Brad - from Pretties Kit or the new Clear Rhinestone Brads. 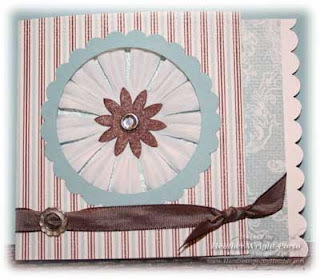 Parisian Breeze Designer Series Paper - only to create the center flower shape but you can quickly and easily use any scraps you may have or use Flower Fusion in instead. Hope these projects inspire you and please share with me your samples/versions if you give them a try!